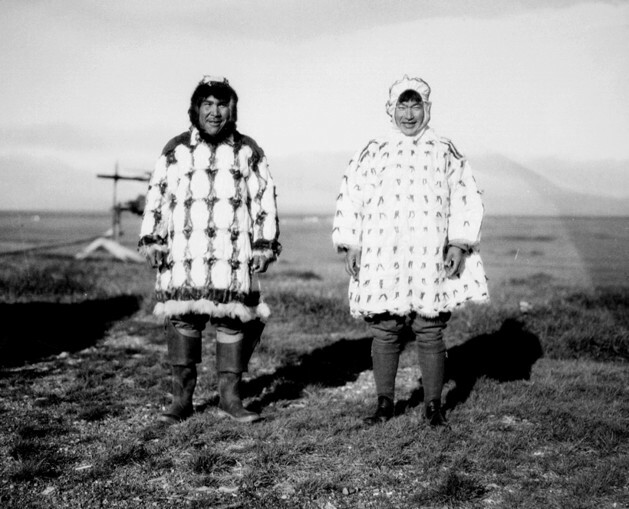 Maligutkaq (Chauncey Maligutkak) wearing a parka made of murre skins and Anengayuu (James Aningayou) wearing a ceremonial gut parka, sanighqaaq, adorned with feathers. Gambell, circa 1930. Photo by Leuman M. Waugh from Faces We Remember: Neqamikegkaput edited by Igor Krupnik and Vera Oovi Kaneshiro, 2011, p. 109. Courtesy of the National Museum of the American Indian, N42764.